In an efford to simplify my online dwellings, I’ve decided to finally use an external service to host my homepage. Since I am generating a static webpage using Hugo, and all its content is public anyway, hosting it on GitHub was the way to go. The move went pretty well, except for the rather confusing, and weird GitHub documentation about Using a custom domain with GitHub Pages. Googling for tutorials will probably help you more. <github_username>.github.io. 3600 IN	CAA   0 issue "letsencrypt.org"
Have patience! DNS might propagate relatively quickly these day, but GitHub takes a while to get it. You might need to clear a few times your GitHub custom domain configuration. The Hugo website has a good How-To on how to get your static stuff hosted on GitHub. Indeed, their solution involves Git Submodules. 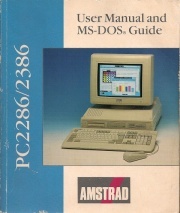 If you wonder what that picture is about: the Amstrad PC2286 was my first ever computer, and that was my first ever computer manual! I found it back in the Web Archives.